The Department of Science and Technology through its Information and Communication Technology Office has formulated Outcome 4.It aims to achieve global leadership in the ITBPM Industry by generating at least 1.3 million jobs in the ICT industry by 2016. Stepping Up the Value Chain initiative is part of the program called DigitalPH composed of three other flagship initiatives; seedPH, Next Wave Cities and Rural Impact Sourcing (RIS). 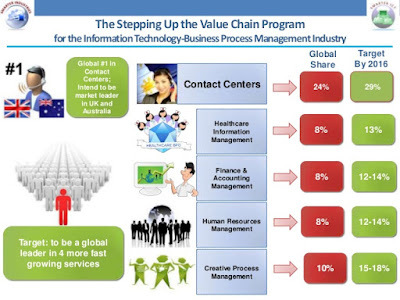 The Philippines remain as the top 1 provider of voice services, there is still a lot of room for growth when it comes to the higher value and more complex services that the country’s IT-BPM segments could cater. 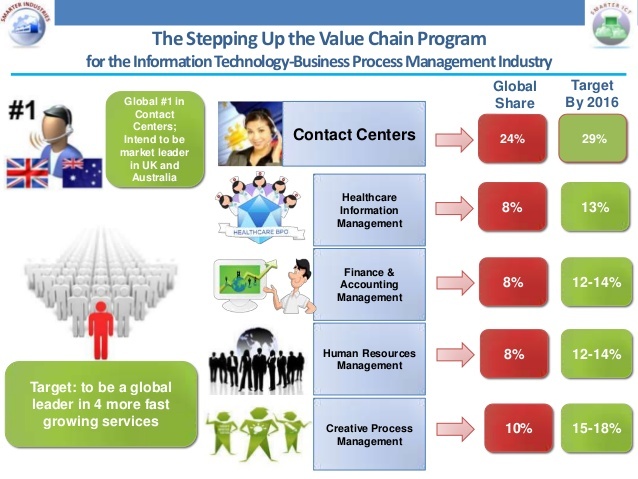 Hence, the Stepping Up the Value Chain program was created to promote these segments, which include information technology, healthcare information management, software engineering and development, animation, and games development. Under this program, the ICT Office supports locally organized international conferences for the different segments of the industry, and conducts trade mission to major international conferences across the world. These will enable the ICT Industry to gain more business from non-voice accounts which has more value added and more downstream industries will be created. This will redound to more jobs generated within ICT-related industries and non-ICT related industries.